Meet your tutor, programme co-ordinator and fellow students at London Heathrow and fly to San Francisco. Transfer to your downtown hotel on Fisherman’s Wharf. The following morning meet with your tutor for a city tour including Fisherman’s Wharf, The Golden Gate Bridge and Park, Union Square and Chinatown. This afternoon, explore the photographic splendours of the Powell Street cable cars, Lombard Street – the ‘crookedest’ street in the world, and Alcatraz Island. Evening critique session. Drive to Yosemite National Park via the Oaklands Bay Bridge and eastwards to Chinese Camp, one of the most famous Gold Rush towns. Follow the Big Oak Flat Road (named after an 11′ diameter oak tree) into the Sierra Nevada Mountain Range and on to Yosemite National Park stopping for photographic opportunities en route. As soon as you enter Yosemite you are surrounded by iconic Ansel Adams frames – there is El Capitan Mountain on the left and Cathedral Rocks on the right, with Bridalveil Falls dropping 620′ from a hanging valley and the top of Half Dome in the background! Continue through the valley and the panoramas continue to impress with the Three Brothers, Sentinel Dome, Yosemite Falls and, of course, Half Dome. Stay in comfortable log cabins in the park itself. Evening illustrated talk. 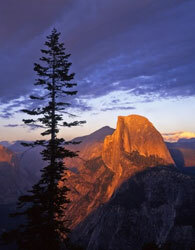 Enjoy 5 full days photographing the natural wonders of Yosemite that have inspired photographers from all over the world. You can explore the more remote areas on foot and bicycle or use the free shuttle bus. Yosemite offers an endless supply of fantastic photographic material, with mountains, lakes, rivers, waterfalls, woods, mountain meadows – not to mention the abundant wildlife. You may even be fortunate enough to see the indigenous small brown bear! Daily critiques and demonstration sessions with your tutor to help you get those award-winning pictures. Drive back to San Francisco. Capture San Francisco by night, with its myriad of neon signs and street performers. Early morning photographic demonstration session at the Golden Gate Bridge, hoping to capture it veiled in mist. Spend the day driving along Highway 1, to photograph the rugged coast at Monterey and Carmel and the famous skyscraper Redwoods at Big Sur. Return to San Francisco. From the tiny man-made ‘Treasure Island’ you get the most impressive illuminated skyline of downtown San Francisco – a befitting closing photographic session before your farewell dinner in Fisherman’s Wharf.